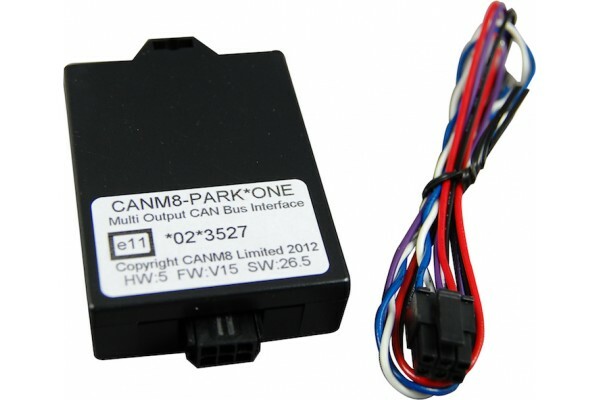 · The CANM8-PARKONE Interface is an intelligent and cost effective solution to provide you with control of Front Parking Sensors from the vehicles’ CAN Bus. 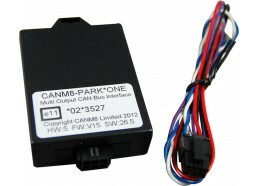 A controlled output of 12v is generated by the interface and is switched off when the vehicles’ speed exceeds roughly 6 mph. · The PARKONE enables you to switch the front sensors off when the vehicles’ car brake is applied, using OE style control of the front parking sensors. This feature helps this interface to avoid the annoying unnecessary emitting tones when the vehicle is stationary near a front facing object. · This simple park interface is perfect for controlling dedicated front parking sensors that don’t produce a ‘power on’ audible warning.